During the Android M introduction portion of the Google I/O keynote in May, Google talked briefly about better text selection and a floating toolbar that accompanied it. Since then, though, we haven’t seen it implemented in that many places, so we had not yet really mentioned it. Now with the Android M Preview 2 out, it seems that the handy little feature is showing up more and more. As a recap, Google introduced a floating toolbar for when you select text. This floating toolbar shows itself just above the text you are selecting, so that you can quickly select all, copy, share, etc. without having to reach all of the way up to the top of your phone or tablet. The floating toolbar even includes an action overflow menu that allows you to search the web with the text you have selected. 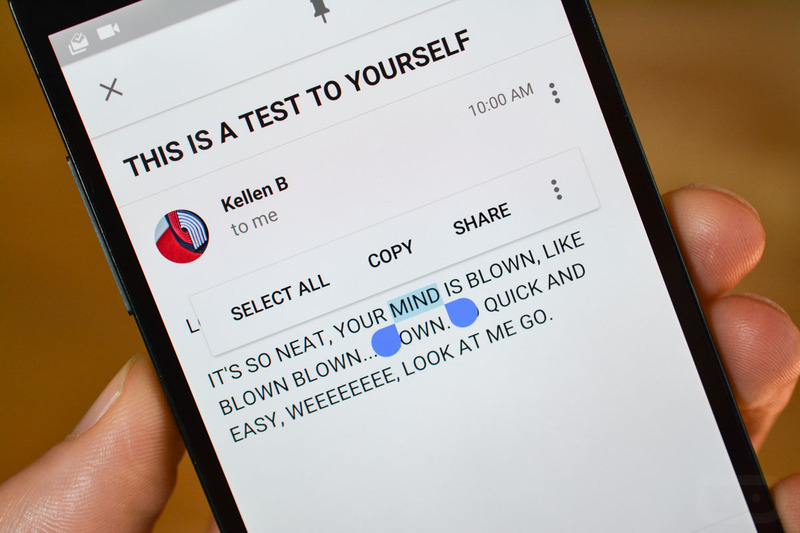 But not only does it make cutting, copying, selecting all, and searching easier, Google also made it easier to select specific text or words while dragging. Instead of having to go character by character to select a word, Google now jumps the selection tool out to the end of words, since most typically select entire words rather than a couple of characters at a time. Sometimes it’s the little things that add up to a great experience.